Our latest cooking saga started innocently enough. 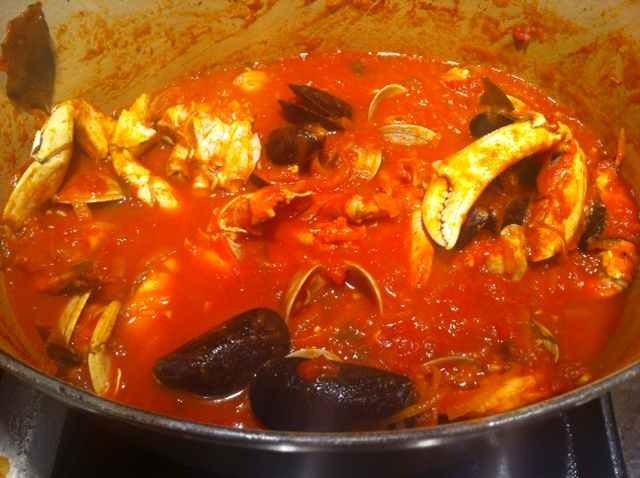 Carolyn said; “we are in California, shouldn’t we post a Cioppino recipe”? And I said, “Sure, I like Cioppino”. Little did I know that this recipe would require some real work. This is not to say you shouldn’t make Cioppino at home. It is not hard to make, but it is hard to get right. This is a dish usually made in restaurants a la minute’, rather than in a big pot at home. So little details do matter, and you need to use a good recipe or you can spend hours (or in the case of Cooks Illustrated, every dish in your kitchen) with little benefit and get an underwhelming dish. And this is a seafood dish, and that means you will be spending some real money on ingredients, so it had better be good. Oh, and did I mention messy to eat? Well, it is. Do not serve this to people who are squeamish about eating seafood with their hands. Eating Cioppino often leads to wearing Cioppino. White clothing is not recommended. – You need to pick the freshest and best seafood available in your area. Don’t compromise, less is more. You can pick from clams, mussels, shrimp, crab (cooked), squid and firm white fish. You do not need all of these ingredients in the Cioppino, but you should start with clams and/or mussels, as their juices will augment the broth. – Cioppino is a two-step process. 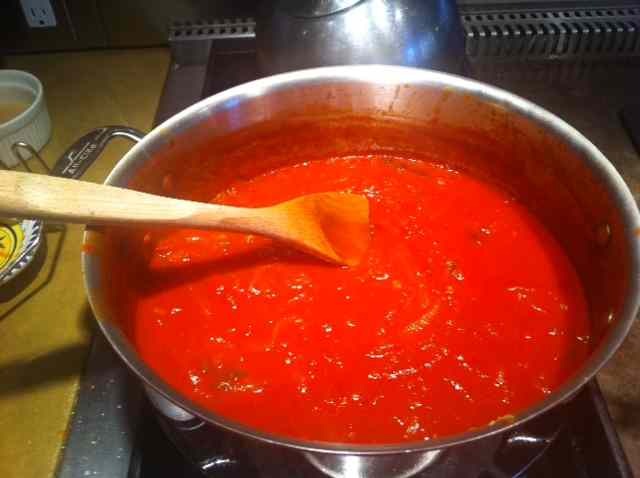 The first step is making a flavorful base of tomato, fish stock or clam juice and aromatics. This can be done ahead of time. In fact, making the base early in the day and/or letting flavors meld in the fridge overnight is a good thing. – Making your own fumet (fish stock) is usually too much of a pain and hard to get right. Frozen fish stock is pretty bland. Unless you make fumet regularly or have a good source for stock, clam juice mixed with some water is a good choice. – As for the second step of the recipe, making the final dish, you need to be paying very close attention throughout. Seafood cooks quickly, and if you are not ready, tender seafood will become rubber before you know it. – Finally, serve the Cioppino in BIG bowls and serve as much as you can at once. Why? Because the seafood left in the big pot will keep cooking and get tough. This may seem fussy, but trust us, you can tell. Or, you can remove all the seafood you don’t serve from the broth and reheat. If you take that path, be ready to clean your entire kitchen. Your choice. Once we got some of the keys figured out, we found the process of making Cioppino pretty straightforward. 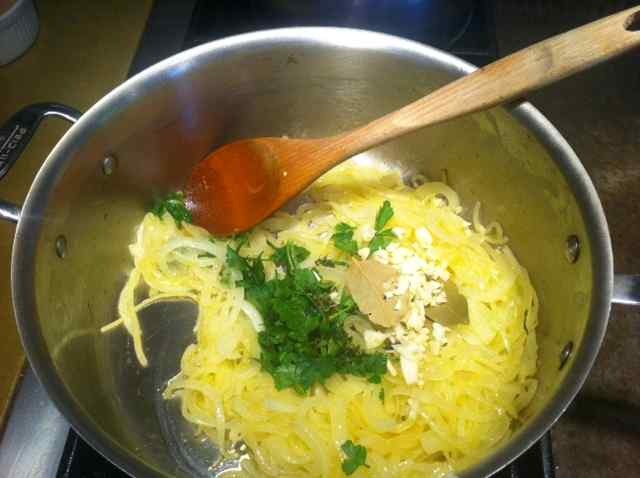 Firstly we started our base with softened aromatics including onion, garlic, parsley, basil and bay. Building the final dish was pretty simple, but did require some attention. We quickly steamed the clams for a few minutes then added the mussels until both started to open. We added the tomato base, brought it to a boil, tasted for seasoning, seasoned and then added the crab, shrimp (and/or fish if you are using), then we covered the pot and turned off the heat. The shrimp finished cooking in 5 minutes with residual heat, but by limiting direct heat the clams and mussels remained tender. We then served the Cioppino immediately in big bowls (could have been even bigger). Our final, and important, step was to liberally squeeze lemon juice over the dish. We consistently found a need for some acidity to counter the sweetness of the seafood and tomato. When eating, we recommend some crusty bread for dipping and a big bowl at the table for empty shells. And bring plenty of napkins. – See above for general guidelines. – Use the widest pot you can when making this dish. Wider pans will allow the seafood to spread and cook more evenly. – Like all seafood dishes, discard any mussels or clams that do not open. What You Get: A hearty seafood stew you can make with store-bought ingredients. What You Need: No special equipment required. A big, wide pot (as noted above) helps. How Long? 2 hours of cooking time with about 30 minutes of active time (plus any time you spend letting the Cioppino base rest). Plan on extra time for the dishes. This is really a weekend dish. Place a large pot or saucepan over medium heat. Once heated add the olive oil and onions. Sweat the onions until soft, stirring occasionally, about 5 minutes. Add the garlic, basil, parsley and bay leaves. Stir frequently for one minute. Do not brown the garlic. Stir in the diced tomatoes, tomato puree, clam juice, water, Worcestershire sauce, celery salt, cinnamon, saffron, red pepper flake and smoked paprika. Bring to a boil and then lower heat and bring to a simmer. Simmer for 1 hour, stirring occasionally. Remove from heat. Remove bay leaves. Use in Cioppino or reserve for later use. Place a wide, deep pot over medium heat. When hot add butter and olive oil. Add garlic and cook, stirring frequently, for 1-2 minutes or until fragrant. Do not brown. Add the clams and wine. Increase heat to medium-high. Cover pot and steam clams for 2-3 minutes or until they start to open slightly. Add mussels and steam for another 2 minutes or until they start to open. Add Cioppino base, stir, and bring to a boil. 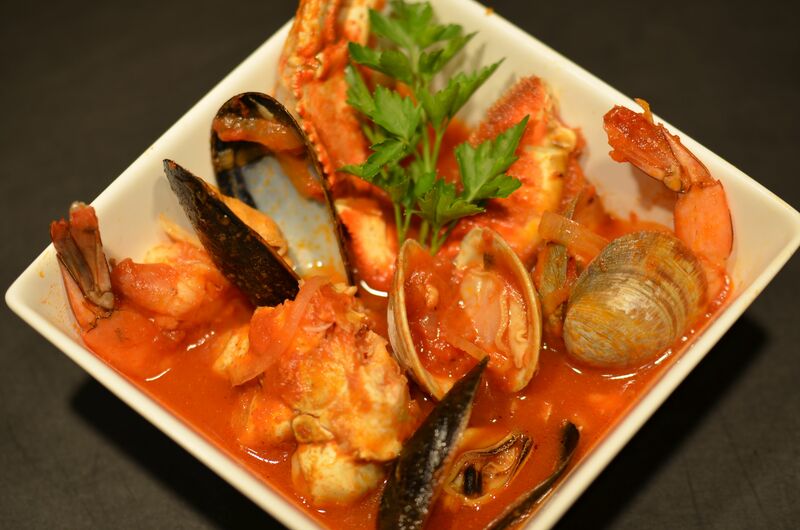 Taste Cioppino and season to taste. Add crab and shrimp, stir and be sure shrimp are submerged. Cover pot, remove from heat and let stand for 5 minutes. The shrimp will cook in the residual heat. When shrimp are done (they will be opaque) ladle the Cioppino immediately into large bowls. Squeeze lemons over the Cioppino and serve with crusty bread. you mention garlic the base recipe instructions but leave it out as an ingredient. how much garlic did you put into the base and did you chop it first? also, in the base recipe ingredients you say 1 can of peeled tomatoes and then the instructions say put in diced tomatoes without any other instructions. did you want us to dice them and include the juice from the can or not? you don’t say in the instruction portion when to put in salt & pepper but I see it above in your overall comments. how long do you put the fish in for and do you chop it or cut it into what size pieces or season it in any way? will it cook in the 5 min. off heat? Sorry that we missed some stuff. Will edit (thx). The ingredient list should say canned, diced tomatoes. But if you have whole ones, just squash them with your hands or the back of a spoon. We did not put fish in this version, but the best way is to cut firm white fish into 3/4 inch pieces. You would add the fish at the same time as the shrimp and let it cook in the residual heat for 5 minutes. or until firm. thanks! made it last night and it came out great!! everyone loved it and I like the way you combined the 3 recipes. I was looking at all 3 myself as the 3 that would have the best results. Glad you liked it! Sorry for the missing details on the recipe, but glad you asked and let us know!